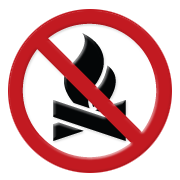 The ban prohibits ALL open fires, including campfires and charcoal briquettes. Portable propane fire pits and gas or propane stoves and barbeques designed for cooking or heating are allowed. This little riverside campground is perfect for relaxing among the giant cottonwoods. There is easy access to the Red Deer River for canoeing, kayaking, fishing, or just floating along through the winding badlands. Firewood is not available on site. Potable water (limited supply) is available from a tap located on the side of the tall storage building during the summer season. From mid-September until the campground closes, potable water is not available. Camping fees are reduced during this period.